By Keith Cowing on July 31, 2015 12:35 AM. "In what many are hailing as the most significant development in the history of space exploration, NASA scientists announced Thursday that a planet seemingly identical to Earth has been discovered by the agency's Orbital Space Mirror. According to NASA, the $2.9 billion aluminum glass mirror, which stretches over 180 feet wide and 147 feet tall, has already produced invaluable data suggesting that our solar system may contain a terrestrial planet of the exact same size, shape, and surface composition as Earth." By Keith Cowing on July 30, 2015 10:15 PM. "The mission to Pluto was meant to complete the exploration of the planets in the Solar System. But scientists reclassified Pluto from a planet to a "dwarf planet" shortly after New Horizons launched in 2006. That reclassification split the space science community. But Stern has a clear opinion about Pluto's demotion: "It's bullsh*t," he told Tech Insider (and said we could quote him on that)." Keith's note: (Sigh) once again this NASA principal investigator sets a new low standard for public discourse. At a time when NASA is focusing on education and inspiring the next generation of space explorers I find it rather odd that a NASA PI, speaking in an official capacity, would be putting forth such a crude example of how NASA scientists conduct themselves in the public's eye - and that he does so over such a tired and worn-out issue. Pluto is Pluto. Get over it. By Keith Cowing on July 28, 2015 8:15 AM. "Tuesday, July 28, 2015: The Science Committee's NASA Authorization Act for FY16 and FY17 restored funds the Obama administration proposed cutting from planetary science budgets. This would bring parity between NASA's science accounts and allow for development of missions like New Horizons to continue at the current pace." Keith's note: The New Horizons team is now openly talking about a New Horizons-2 mission back to Pluto. It will be interesting to see if this topic is raised given that this committee is on the record about their interest in Europa - not Pluto. Also, given the NASA's budgetary issues, it will be interesting to see how the extra $1 billion-plus needed for New Horizons-2 would be squeezed out of an already constrained budgetary future - one that will inevitably stressed by SLS costs. By Keith Cowing on July 27, 2015 10:00 AM. Keith's note: The use of social media during the recent Pluto encounter has been widely hailed. That said, Southwest Research Institute Public affairs continues with its slightly strange media policy - in this case by blocking @NASAWatch from following @NewHorizons2015 on Twitter. Despite the recent "personal" label on this Twitter account, this account is used by a SWRI employee for NASA-funded work-related news and has been mentioned in official SWRI, JHUAPL, and NASA communications for years. You'd think that SWRI would want the biggest audience available - and a retweet by @NASAWatch could add 59,000 Twitter impressions. With all this bragging (justifiably) by NASA PAO about their social media prowess, this effort by SWRI is odd to say the least. I asked SWRI about this several times and they have declined to respond. By Keith Cowing on July 24, 2015 11:26 PM. "[ESA Director General Johann-Dietrich Wörner]: The Americans are saying Mars is the ultimate goal, but I'm rather convinced that Mars is not the ultimate goal. If we continue on planet Earth, I'm sure humans will go even beyond Mars, but the question is when and how. We need some targets in between. The Moon is a very scientifically interesting body and it's reachable by humans even with today's technology. For Mars and other bodies, we need totally different technologies. Imagine if you send a human to Mars on a two-year return journey and after two months he or she gets difficult health problems. What do you do? We have to have better technology, stronger launchers and other propulsion systems, to go to Mars." By Keith Cowing on July 24, 2015 2:57 PM. "Speeding away from Pluto just seven hours after its July 14 closest approach, the New Horizons spacecraft looked back and captured this spectacular image of Pluto's atmosphere, backlit by the sun. The image reveals layers of haze that are several times higher than scientists predicted." By Keith Cowing on July 24, 2015 9:40 AM. "A NASA-sponsored study has been released which outlines a plan to return to the Moon with people and set-up an outpost at one of the poles to mine water for propellant. This report has drawn both attention and puzzlement within the space community, as the agency continues to make clear that they have no interest in human lunar missions. This disconnect is covered because NASA will not do these activities - instead, the agency will pay commercial companies to develop and implement the plan. The propellant produced at the outpost from lunar polar water will then be sold to NASA for use in future human missions to Mars." By Keith Cowing on July 23, 2015 4:33 PM. "Potential reach and Number of Mentions of all social media posts(NASA & non-NASA) across 21 different social media platforms using one or more of the following keywords between July 13-17, 2015: Pluto, "New Horizons", #PlutoFlyby, or #Pluto:"
"Organizations can sometimes let social media metrics obscure their core goals and mission. (Trust us on this.) On the evening of July 14, the world was waiting for New Horizons to phone home and say it had successfully passed by Pluto. With less than two minutes until the message was scheduled to arrive, the cameras cut to (drumroll) a NASA social media representative, who proceeded to tell the world how high New Horizons was trending on Facebook, Twitter, and Instagram. The Pluto Press Corps was not too amused. The camera cut to New Horizons Mission Operations Manager Alice Bowman in the nick of time, seemingly the moment she received the I'm-OK signal from New Horizons. For a moment, it seemed, NASA's ace team of publicists had forgotten that the cameras were supposed to be on Pluto." By Keith Cowing on July 23, 2015 12:00 PM. "NASA will host a news teleconference at 9 a.m. PDT (12 p.m. EDT) Thursday, July 23 to announce new discoveries made by its planet-hunting mission, the Kepler Space Telescope. The teleconference audio and visuals will be streamed live at: http://www.nasa.gov/newsaudio"
"The new catalog includes 12 candidates that are less than twice Earth's diameter, orbiting in the so-called habitable zone of their star. This zone is the range of distances at which the energy flux from the star would permit liquid water to exist on the planet's surface. Of these candidates, Kepler 452b is the first to be confirmed as a planet. At a distance of 1,400 light-years, Kepler 452b accompanies a star whose characteristics are very similar to the Sun: it is 4 percent more massive and 10 percent brighter. Kepler 452b orbits its star at the same distance as Earth orbits the Sun." "The newly discovered Kepler-452b is the smallest planet to date discovered orbiting in the habitable zone -- the area around a star where liquid water could pool on the surface of an orbiting planet -- of a G2-type star, like our sun." By Keith Cowing on July 22, 2015 11:44 PM. Keith's note: If you watched Sharknado 3 on SyFy tonight then you know that a substantial portion of the film was shot at JSC and KSC. Yes, the movie was utterly stupid (that was the whole point of the movie) but NASA allowed itself to be part of something outside its usual stodgy comfort zone. You may argue whether or not this is the best use of NASA facilities. I look at it this way: last week NASA owned the Internet during the Pluto Flyby. Tonight they were an integral part of an event that owned Twitter and other social media platforms. Not bad. By Keith Cowing on July 22, 2015 7:15 PM. - It's our biggest mission-related traffic event since we joined DAP in February 2013, with nearly 10 million page views on July 14th alone. During the 7 am hour, 42% of all government traffic was going to NASA pages. ..."
By Keith Cowing on July 21, 2015 12:17 AM. "If you underwent a background investigation through OPM from 2000 or thereafter (which occurs through the submission of forms SF 86, SF 85, or SF 85P for a new investigation or periodic reinvestigation), the OPM says there is a high likelihood that anyone who filled out one of those SF forms has had their information compromised." 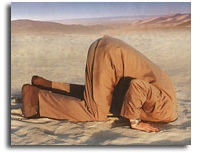 Keith's note: All that talk from NASA about securing personal information as they complied with HSPD-12 and ... oh well. FWIW anyone who was screened for a NASA headquarters press pass a few years back (when they actually issued them) was at risk. Guess who got an OPM letter as a result of that screening. Thanks a bunch NASA. By Marc Boucher on July 20, 2015 11:14 AM. "A NASA camera on the Deep Space Climate Observatory satellite has returned its first view of the entire sunlit side of Earth from one million miles away." "This color image of Earth was taken by NASA's Earth Polychromatic Imaging Camera (EPIC), a four megapixel CCD camera and telescope. The image was generated by combining three separate images to create a photographic-quality image. The camera takes a series of 10 images using different narrowband filters -- from ultraviolet to near infrared -- to produce a variety of science products. The red, green and blue channel images are used in these color images." By Marc Boucher on July 19, 2015 10:28 PM. "In auto racing parlance, NASA engineers put the "pedal to the metal" during a July 17 test of its Space Launch System (SLS) RS-25 rocket engine at Stennis Space Center." "During a 535-second test, operators ran the RS-25 through a series of power levels, including a period of firing at 109 percent of the engine's rated power. Data collected on performance of the engine at the various power levels will aid in adapting the former space shuttle engines to the new SLS vehicle mission requirements, including development of an all-new engine controller and software." By Marc Boucher on July 17, 2015 2:15 PM. "In the latest data from NASA's New Horizons spacecraft, a new close-up image of Pluto reveals a vast, craterless plain that appears to be no more than 100 million years old, and is possibly still being shaped by geologic processes." "This frozen region is north of Pluto's icy mountains, in the center-left of the heart feature, informally named "Tombaugh Regio" (Tombaugh Region) after Clyde Tombaugh, who discovered Pluto in 1930." "This terrain is not easy to explain," said Jeff Moore, leader of the New Horizons Geology, Geophysics and Imaging Team (GGI) at NASA's Ames Research Center in Moffett Field, California. "The discovery of vast, craterless, very young plains on Pluto exceeds all pre-flyby expectations." By Keith Cowing on July 16, 2015 10:10 AM. "How exactly NASA stumbled upon perhaps the greatest social-media strategy of our time is a story of both blind luck and shrewd management. Of course, the space agency benefits by having amazing pictures, videos, and discoveries to share. Its content transcends demographics and platforms, because it highlights precisely what makes us so human. But its success also contains important lessons for any large organization trying to understand how to break down the barriers between itself and its public." Keith's note: Every time something like this happens people make all sorts of claims about NASA's Internet prowess - but NASA never issues any numbers to substantiate these claims. I have no doubt that the stats are/were impressive. I have asked NASA for their web and social media statistics. I'll post what they send me - if they send me anything, that is. By Keith Cowing on July 15, 2015 10:50 PM. "America needs a space policy that has a vision that can build on past achievements and keep moving forward. A big part of that is construction, maintenance and servicing in low-Earth orbit. Another is international cooperation. And we should realign our goals with those of other major space-faring nations and look back to the Moon, so we again become the leaders in space. After all, we've been there before. A lunar exploration program would provide the foundation for manned missions beyond the Moon. Our eyes must look to the skies with purpose toward that limitless frontier." By Keith Cowing on July 15, 2015 9:38 PM. "The SLS vehicle design materialized from an extensive, unbiased set of NASA technical studies that compared all possible scenarios, with a focus on efficiency and budget constraints. Experts inside and outside of NASA were fully integrated into the decision-making process. Among the factors driving the selection of the 130 metric-ton SLS design were human exploration requirements, the state of propulsion technology, the health and capability of the industrial base and the overall budget outlook." Keith's note: I had to read this several times. "Unbiased"? Hardly. I guess these guys think that if they say something often enough as an op ed it will become the truth. The SLS design was mandated in law by Congress to use Shuttle and Ares V leftovers so as to preserve jobs. NASA adjusted their plans to this mandate. Everything else was window dressing. To state otherwise is to spread false memories about things that never happened. By Keith Cowing on July 15, 2015 7:08 PM. "To its credit, NASA has taken steps to reduce and control the operations and maintenance costs of the ISS, including competing contracts and eliminating some unneeded requirements. However, due to the unique operating environment of the ISS, in many cases the Agency continues to use incumbent contractors and obtain most services via cost-reimbursement contracts. We acknowledge the difficulty associated with contracting for ISS operations and urge NASA to continue to seek opportunities to control Station operations and maintenance costs, including revisiting the fixed-price option when appropriate." By Keith Cowing on July 15, 2015 12:33 PM. "Although they value the program and are proud of its achievements, Americans are reluctant to pay more for space exploration. Just 23% of Americans said the U.S. spends too little on space exploration, according the National Opinion Research Center's General Social Survey (GSS) conducted last year. About four-in-ten (42%) said the U.S. spends about the right amount, and 25% said the U.S. spends too much on space exploration. Americans were more likely to say the government is spending too little on areas such as education (70%) and health (57%)." Keith's note: Hmmm ... this is going to be a problem if NASA wants to send astronauts on the #JourneyToMars given that a substantial increase in NASA's budget - sustained over a long period of time - will be required to make this happen. One would hope that NASA would be a little more honest and open on this matter - if for no other reason to describe the coming need for budget increases and then lay the ground work and build some public sentiment for budget increases. By Keith Cowing on July 14, 2015 11:51 PM. 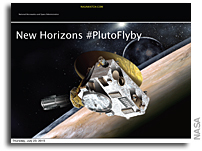 Keith's note: The New Horizons flyby of the Pluto system is quite an accomplishment. Say that 10 times. And congratulations are to be offered to everyone who made it happen - regardless of their contribution. Alas, the thanks have to include the 300,000,000 people who paid for it. To be certain, this mission is nerd cool and exciting - and inspirational - even if you do not know all (or any) of the science behind it. But at the end of the day, how many of the 300,000,000 people who paid for this truly understand what was done, why it was done, and why it was more important to spend ~$700,000,000 on this as opposed to [fill in the blank]. To be certain, that is $2.33 each. But what could $700,000,000 do in their own community where unemployment is high or where schools are crowded? Space supporters chuckle at this sort of math because space is cool by definition (so, who cares), but non-nerd taxpayers vastly outnumber nerds (of any flavor) or space supporters. Tonight Charlie Bolden actually said that this mission (launched almost a decade ago) was a necessary step on the #JourneyToMars established by the Obama administration a few years ago. That, of course, is nonsense. You do not need to go 3 billion miles to Pluto so that you can go 100 million or so miles to Mars and back. Until NASA decides to come clean and be straight with taxpayers - and comes up with a story that passes the who/what/when/where/why smell test it will have enough funds to do some wow stuff now and then - but nowhere near enough to do the big things that its Public Affairs office would have you think are a done deal. By Keith Cowing on July 14, 2015 9:09 PM. "The call everyone was waiting for is in. NASA's New Horizons spacecraft phoned home just before 9 p.m. EDT Tuesday to tell the mission team and the world it had accomplished the historic first-ever flyby of Pluto. "I know today we've inspired a whole new generation of explorers with this great success, and we look forward to the discoveries yet to come," NASA Administrator Charles Bolden said. "This is a historic win for science and for exploration. 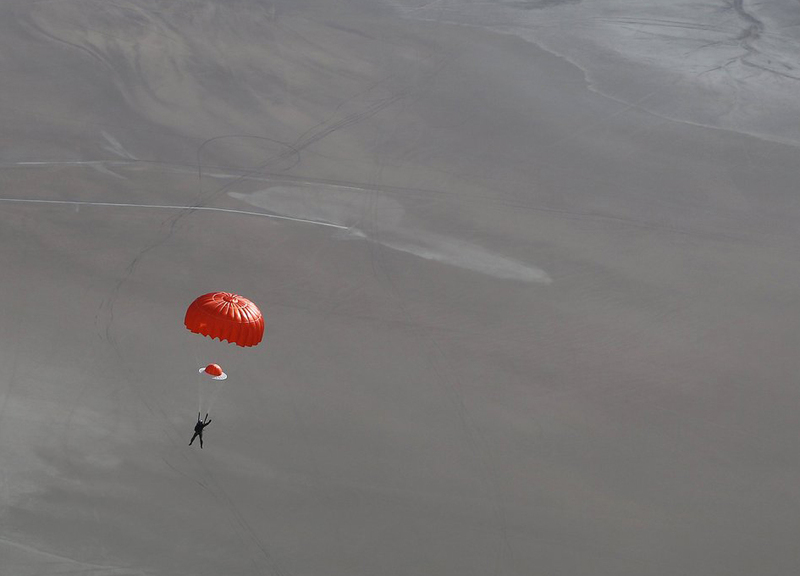 We've truly, once again raised the bar of human potential." By Keith Cowing on July 14, 2015 9:04 PM. By Marc Boucher on July 14, 2015 3:00 PM. "New Horizons has obtained impressive new images of Pluto and its large moon Charon that highlight their compositional diversity. These are not actual color images of Pluto and Charonthey are shown here in exaggerated colors that make it easy to note the differences in surface material and features on each planetary body." "As New Horizons flew by Pluto on its closet approach today NASA released the best ever image of the planet. Should the spacecraft has survived its closet approach and did collect the data it was expected to, we should see much more stunning images in the coming days." - Get the latest updates. - Live updates. Next update at 9:30 pm ET. By Keith Cowing on July 14, 2015 8:13 AM. "Today, our nation is poised to reach a new milestone in exploration and discovery. More than 50 years after our first flyby of another planet, and five years after President Obama challenged America's space program to extend humanity's reach in space while strengthening America's leadership here on Earth, the New Horizons spacecraft will reach Pluto, providing the closest view humanity has ever seen of the dwarf planet." "Because New Horizons is the fastest spacecraft ever launched hurtling through the Pluto system at more than 30,000 mph, a collision with a particle as small as a grain of rice could incapacitate the spacecraft. Once it reestablishes contact Tuesday night, it will take 16 months for New Horizons to send its cache of data 10 years' worth -- back to Earth." By Keith Cowing on July 13, 2015 12:50 PM. By Keith Cowing on July 12, 2015 8:22 PM. "New Horizons' newest images reveal Pluto's largest moon Charon to be a world of chasms and craters. The most pronounced chasm, which lies in the southern hemisphere, is longer and miles deeper than Earth's Grand Canyon, according to William McKinnon, deputy lead scientist with New Horizon's Geology and Geophysics investigation team." By Keith Cowing on July 12, 2015 11:28 AM. "Three billion miles from Earth and just two and a half million miles from Pluto, NASA's New Horizons spacecraft has taken its best image of four dark spots that continue to captivate. The spots appear on the side of Pluto that always faces its largest moon, Charonthe face that will be invisible to New Horizons when the spacecraft makes its close flyby the morning of July 14. New Horizons principal investigator Alan Stern of the Southwest Research Institute, Boulder, Colorado, describes this image as "the last, best look that anyone will have of Pluto's far side for decades to come." By Keith Cowing on July 11, 2015 11:12 AM. "It began as a point of light. Then, it evolved into a fuzzy orb. Now in its latest portrait from NASA's New Horizons spacecraft Pluto is being revealed as an intriguing new world with distinct surface features, including an immense dark band known as the "whale." As the newest black and white image from New Horizons' Long Range Reconnaissance Imager (LORRI) appeared on the morning of July 10, members of the science team reacted with joy and delight, seeing Pluto as never before. There will no doubt be many similar moments to come. New images and data are being gathered each day as New Horizons speeds closer to a July 14 flyby of Pluto, following a journey of three billion miles." By Keith Cowing on July 10, 2015 11:08 AM. "The Subcommittee on Space will hold a hearing to examine the current status of the International Space Station (ISS). The Subcommittee will evaluate the National Aeronautics and Space Administration's (NASA) plans for dealing with operational and maintenance challenges, the status of the ISS partnership, how NASA is utilizing the ISS to enable future deep space exploration, and the Administration's request to extend ISS operations to 2024." By Keith Cowing on July 10, 2015 7:00 AM. Keith's note: The Planetary Society sent a press release out late yesterday - under embargo - to their media distribution list. This list used to include NASAWatch - but no longer does. Why? Who knows, maybe they are thin-skinned over NASAWatch criticism about their various semi-secret stealth space policy activities. The release is titled "Bill Nye and The Planetary Society Celebrate New Horizons Pluto Flyby - Nye Congratulates Project Team & Citizens Who Made Dwarf Planet Mission Possible ". Yes - its all about Bill Nye™ first - and the Planetary Society second, and Pluto third. This nerd celebrity thing is getting to be rather silly. No, I am not going to post their release ahead of the embargoed release date/time. That's for The Bill Nye™ Society to release. Keith's update: Looks like Marc got a copy of this release late last night and found it in his spam folder this morning (I did not find one in my spam folder). The Planetary Society used to send me things directly. Not any more. Nor did they respond to email on the topic. My point about the Bill Nye™ science nerd celebrity thing still stands. By Keith Cowing on July 8, 2015 2:32 PM. By Keith Cowing on July 6, 2015 4:15 PM. "These are the most recent high-resolution views of Pluto sent by NASA's New Horizons spacecraft, including one showing the four mysterious dark spots on Pluto that have captured the imagination of the world." By Keith Cowing on July 6, 2015 2:09 PM. "The New Horizons spacecraft experienced an anomaly the afternoon of July 4 that led to a loss of communication with Earth. Communication has since been reestablished and the spacecraft is healthy. " "NASA's New Horizons mission is returning to normal science operations after a July 4 anomaly and remains on track for its July 14 flyby of Pluto." "NASA will host a media teleconference at 3 p.m. EDT today to discuss the New Horizons spacecraft returning to normal science operations after a July 4 anomaly." By Marc Boucher on July 3, 2015 8:25 AM. "Less than a week after the SpaceX resupply mission to the International Space Station ended in failure, the Russian Progress 60 cargo resupply mission launched on schedule to bring much needed supplies to the International Space Station. The cargo spacecraft is carrying over 2700 kilograms of food, fuel and supplies for the Expedition 44 crew members. The supplies will arrive on Sunday." By Keith Cowing on July 1, 2015 10:13 PM. "New color images from NASA's New Horizons spacecraft show two very different faces of the mysterious dwarf planet, one with a series of intriguing spots along the equator that are evenly spaced. Each of the spots is about 300 miles in diameter, with a surface area that's roughly the size of the state of Missouri." "After seven weeks of detailed searches for dust clouds, rings, and other potential hazards, the New Horizons team has decided the spacecraft will remain on its original path through the Pluto system instead of making a late course correction to detour around any hazards. Because New Horizons is traveling at 30,800 mph (49,600 kph), a particle as small as a grain of rice could be lethal."